WHAT: Congressman McNerney (D-Stockton) will host a Congress At Your Corner meeting in Antioch to discuss issues and concerns with people in the community. 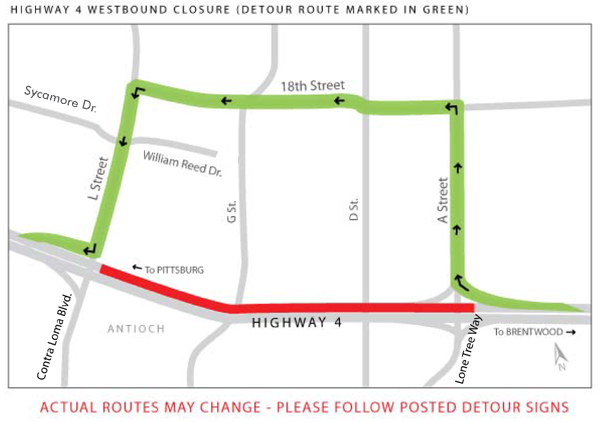 The California Department of Transportation (Caltrans) and the Contra Costa Transportation Authority (CCTA) are widening State Route 4 (SR-4) through Pittsburg and Antioch. As part of this construction work, the contractor will be installing temporary supports for the construction of one half of the G Street Overcrossing. In order to ensure crew and public safety during this work, the contractor will close all lanes of SR-4 in the westbound direction between Lone Tree Way/A Street and Contra Loma Boulevard/L Street, and the westbound on-ramp from Lone Tree way/A Street to SR-4 on Tuesday through Friday evenings, February 26 through March 1, from 11:00 pm until 3:00 am. The contractor will also close all lanes of SR-4 in the eastbound direction between Contra Loma Blvd/L Street and Lone Tree Way/A Street on Tuesday through Friday evenings, February 26 through March 1, from 11:59 pm until 4:00 am. o Westbound motorists will be directed off the highway at Lone Tree Way/A Street, right on A Street, left on 18th Street, left on L Street, and right on westbound SR-4 on-ramp. 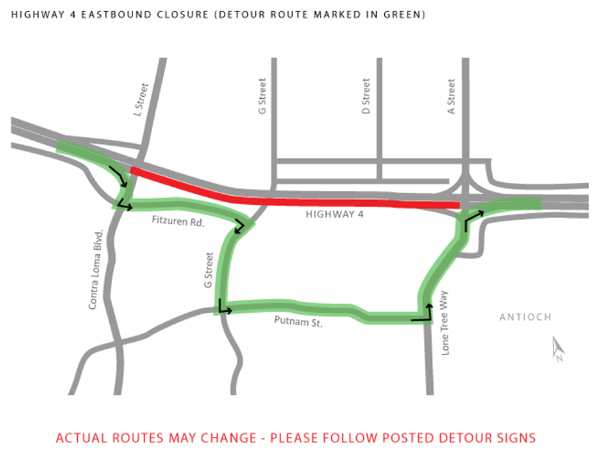 o Eastbound motorists will be directed off the highway at Contra Loma Boulevard/L Street, right on Contra Loma Boulevard, left on Fitzuren Road, right on G Street, left on Putnam Street, left on Lone Tree Way, right on eastbound SR-4 on-ramp. For detour map, please see attachment. Motorists are advised to expect delays and allow extra time for their commute. Please drive with caution through the detours and leave a safe traveling distance between your vehicle and the vehicle ahead of you. Caltrans and CCTA appreciate your patience as we work to improve the highways. 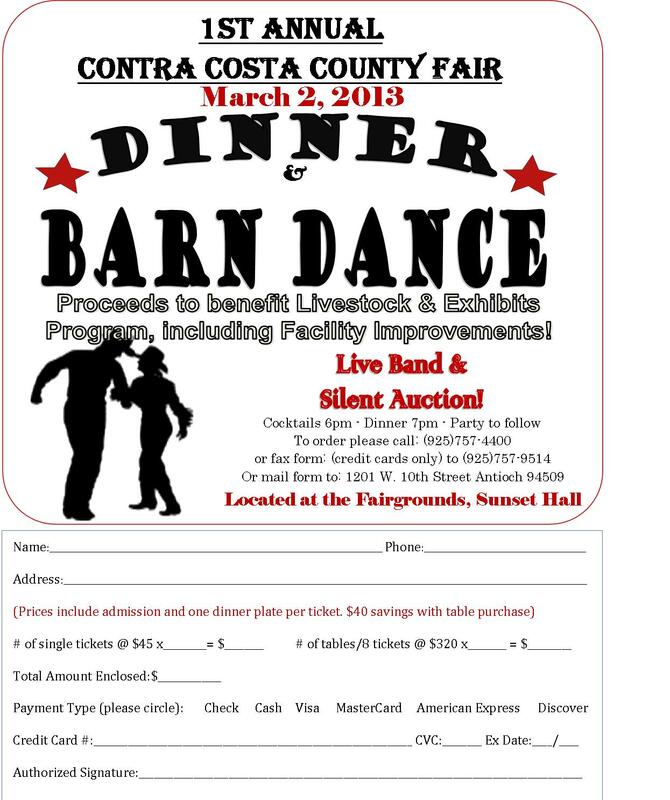 For the most current information on all SR-4 corridor closures please visit our web site at: http://4eastcounty.org. Frederick Augustus Washington Bailey, better known as Frederick Douglas, was born in slavery. The exact year of his birth was not known. However, in 1841, he changed his name to Frederick Douglas. He was such an impressive orator that many people doubted that he had ever been a slave. On the other side of the Atlantic, some 100 years before Frederick Douglas, the transatlantic slave trade was well in place. In fact, transatlantic slave trade vessels had carried over 12 million enslaved Africans from their motherland to various regions of the world. The nine routes that were commonly used by these voyages were challenging and under extremely harsh conditions. The rough seas, tight quarters, and long journeys (55 to 114 days) made experienced crew members uncomfortable and afraid. Many of the enslaved Africans arrived to Western Europe, United States, and the West Indies alive, but in poor physical and mental health. You see, on a typical voyage there were 300-3,000 enslaved African men, women and children all crowded in hot and humid in despicable filth. For example, males were put in six feet long by 14 inches spaces. Each was chained from ankle to wrist and given a bucket for excrements. These horrible sanitary conditions and torture lead many to attempt throwing themselves overboard. On many accounts, suicide occurred almost daily. There are many causes of mortality with the transatlantic slave trade. From a public health perspective, environmental, political, and social injustice were the culprits. Nonetheless, insect-borne fever (typhus, malaria, diarrhea) were more prevalent among enslaved Africans during the middle passage of the journey. Small pox, measles, scurvy, yaws, and African Sleeping sickness were responsible for nearly 51.9% of deaths during this period of the journey. Also, violence, food and water shortages, and suicide contributed (34.8%) to their horrific deaths, especially during the pre-boarding phase and the post-arrival phase. It wasn’t until 1781 when the British parliament enacted legislation requiring all British slave ships to carry an experienced surgeon. As a matter of fact, there were incentives for surgeons and ship captains that arrived in America with low (2%-5%) mortality rates. Cash incentives were given to captains and surgeons with ships which had a mortality rate below 2%. This legislation ultimately led to a reduction in the number of enslaved Africans carried on slave vessels. In 1819 (about the estimated year of Mr. Douglas’s birth), the U.S.A. and Britain pass legislation and regulations requiring medical care on all slave ships; surgeons to keep and attest to accuracy of records; food and provisions for all enslaved Africans; and limiting the caring capacity of all slave ships. William Wilberforce, a member of British parliament led the fight against slave trade and ultimately won its abolition in Britain in 1836. Ironically, Frederick Douglas had just begun the fight to end slavery in the United States. It would take a civil war, a courageous president, and another 30 years of social injustice and over 100,000 deaths to calm the troubled seas of the transatlantic slave trade. Haines, R. McDonald, J. & Sholowitz, R. (2001). Mortality and Voyage length in the Middle Passage Revisited Exploration in Economic History, vol 37(4), p. 503-533. Klien, H. S. & Engerman, S.L. (1997), Long-Term Trends in African Mortality during the Transatlantic Slave Trade, p.36-48. William and Mary Quarterly, 3rd series, Vol I. VIII, No. 1, January 2001, pg. 93-118. Jeff Belle is a graduate student and does extensive research and lectures in public policy and health care issues. He lives in Antioch. Does the City of Antioch have its priorities backwards? In the City Manager’s June 26, 2012 report to Council, where he laments the loss in property tax revenues which affected the city’s ability to maintain the level of services provided to the public, he lists 21 future challenges that will enrich the city and make Antioch “an even more enjoyable place to live, work and play“. First on his list is “continue to develop Executive Management Team.” Re-establish code enforcement function at some level is number 11 and last on his list is “support community efforts to pursue enhanced funding for law enforcement” which is the only reference to the police department on his list. We’d all like to see the Police Department at optimum staffing (more police, less crime) but he better be thinking of neighborhood watch – not another sales tax measure or parcel tax increase which the Mayor and council seem to be lobbying the public for. If so, I have news for them. We’re broke. We’ve been hit with higher sewer, water, power, food prices, new special assessments, e.g., two Antioch Unified School District bond measures and we live in a state that has the highest sales tax, personal income tax and the second highest gas tax in the nation. Seems to me, that lately government at all levels (federal, state and local) is becoming accustomed to asking voters to pay more whenever their funds run short as a result of fiscal mismanagement. Folks, it wasn’t just declining property tax revenues which got us in this mess. It was a serious of egregious decisions on the part of the City Manager and City Councils. The first bad decision to lay off 20 non-sworn Community Service Officers who performed a variety of duties which allowed sworn police officers more time on the street. The second was to let the number of sworn police officers fall to a new low, resulting through the end of 2012 with violent crime up 30.6% from 2011, total crime up 24%, burglaries and aggravated assaults up and arrests down 13.6%. The final straw occurred in December, after the swearing in of Mayor Harper and the new city council members. That’s when, upon the urging of Police Chief Allan Cantando and City Manager Jim Jakel, council amended Article IX – of the former agreement with Antioch Police Officers Association (APOA) which was to terminate on August 31, 2016. That agreement, which required they pay a gradual increased portion of their retirement benefits, gave officers a 6% salary increase effective the first pay period after March 1, 2012, a 3% increase in March 2013 , a 4% hike in September 2013, two additional days off a year and modified the 3% at age 50 to 3% at 55 (3-year average) for new hires. Why then, knowing the city had $59 million of debt for under funded retirement benefits, did they restore the more lucrative 3% at 50 pension formula for veteran police officer hires. They had to know that it was not necessary to do so in order to compete for lateral recruits because the following cities had adopted a 3% at 55 retirement formula: Tracy (Wade Harper’s former employer), Benicia, Brentwood, Concord, Fairfield, Hercules, Martinez, Pittsburg, San Ramon, and Walnut Creek. The good news is that property tax values are on the rise and, as of March 11, 2013, the police department is projected to be at 90 filled positions, with 12 vacancies, two CSO’s have been hired and another is starting in March, four trainee candidates are starting at the CCCSO academy on April lst and there are numerous trainee, lateral and academy graduate candidates in various stages of the hiring process. Tuesday, February 12th was the best of nights; it was the worst of nights. The bad news was the grim crime numbers in Chief Cantando’s annual ‘State of the Antioch Police’ address. We are blessed that the Chief is a great communicator, straight up guy, and Antioch resident, who as a parent and homeowner, lives and breathes our daily dilemmas. The Council, as well, is to be commended for their unity of resolve. Any ideological differences were cast aside as Mayor Harper, Vice Mayor Rocha and Counselors Gary Agopian, Tony Tiscareno and Monica Wilson all committed to fully supporting the Chief. It is going to take everyone on deck, from top city brass to everyday citizens, to turn this ship around. To their credit this Council acutely realizes crime is the City’s pivotal issue. Safety, after all, consumes Antioch’s conversation at the office water cooler, the beauty salon and the family dining table. Some positive underscored in that we seemingly have hit bottom on police staffing with a handful of recruits gestating. It was heartening to also hear that deteriorating response time is finally flattening out. Other news, though, was chilling. We have 88 sworn officers, one more than in 1995 when we had 28,000 less citizens. The Chief said that our previous high water mark of 126 officers is minimum baseline, with 144 ideal. Remember, we currently have no school community resource officers, gang prevention, narcotic, or traffic control units. Community service officers are just trickling back and code enforcement is bare minimum. You can’t make filet mignon out of hamburger, try as our dedicated officers do. Antioch violent crime is up 30.6% from last year; burglaries seem epidemic; our crime rate doubles that of neighboring Pittsburg; and, as perspective, Antioch High had four lockdowns last year due to shootings within proximity. Obviously, we can’t afford to do nothing because, like it or not, we pay a price everyday; in daily anxiety, looking over our shoulders as we walk the dog or go to our cars in the store parking lot; worrying when we get back home from work if our house is undisturbed; fearing vacation absence; and seeing depreciated real estate values. The Chief, our brave men and women in blue, and our City Council, need and welcome your ideas and your unwavering support. Please come to a Town Hall Meeting on crime at Beede Auditorium at 6 p.m. on Thursday, February 28th. We are a resilient lot. Antioch can and will reclaim public safety. OK. Readers. 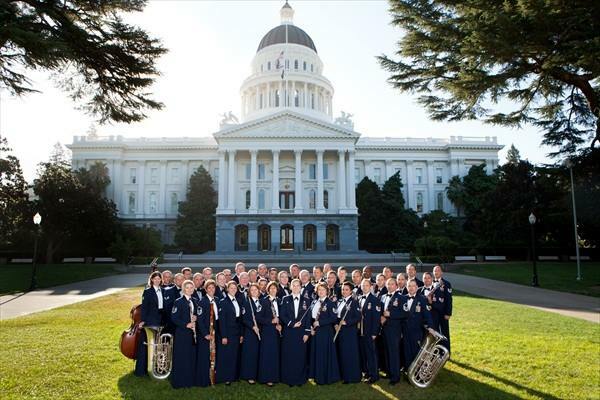 Whoever emails me at info@antiochherald.com or calls me at (925) 457-5324, first wins two free tickets to see the U.S. Air Force Band perform at the El Campanil Theatre, tomorrow, Saturday, February 16 at 3:00 p.m. This is our way of showing our readers some love during this Valentine’s week. On Friday, February 15 at 12:56 p.m., Antioch Police officers were dispatched to a possible fight in the parking lot of the Burger King located at 4620 Lone Tree Way. Prior to officers’ arrival, dispatch received information from a caller that one of the involved parties shot himself in the leg. Preliminary information indicates during the confrontation, a 15 year-old Antioch resident attempted to retrieve a gun he had concealed in his waistband and accidentally shot himself. The male was transported to a local hospital with apparent non-life threatening injuries. This investigation is still ongoing and no further information is available at this time.